Today's installment comes from Brambleberry Cottage who shares such a simple smart idea, it's close to genius. This might be the best idea I've seen for reusing old windows and adding visual interest to an outdoor space at the same time. 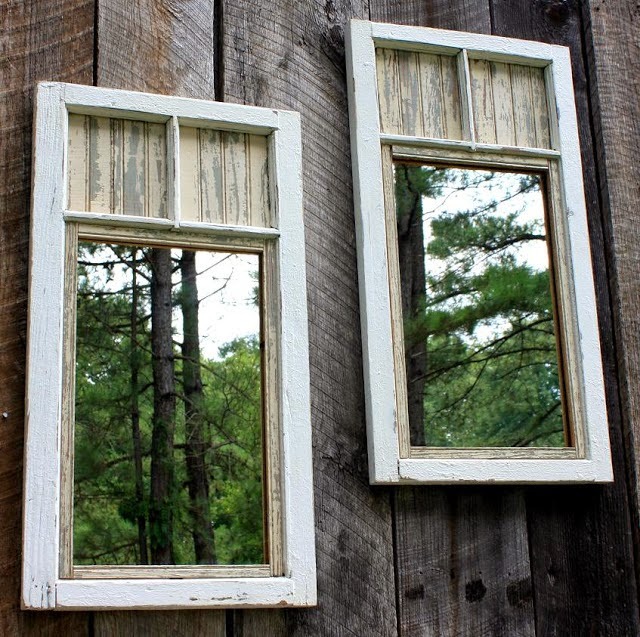 By adding mirrors to old windows and pointing them toward something pretty, she added a feeling of space and light to her backyard. If I ever have a bigger backyard with real trees, I'll be stealing this idea big time. She hung these on a barn but they would be really fabulous on a fence in an urban backyard as well. Thanks KSF. I guess the wild bird population in NYC is wise to this problem b/c Ive never seen any issues with outdoor mirrors but thats good to know. I love these as well but I have to add another caution to outdoor mirrors. In sunny,dry, drought ridden areas, reflected sunlight can start a fire so be sure the mirror does not get any direct sunlight to reflect. I love outdoors mirrors. Usually I see them in conjunction with a formal water feature, but there's a house in a Los Angeles suburb called Forest of Mirrors that lined their entire backyard and parts of their house with old, tall, closet door mirrors, and it massively expands the view. I like the faux-window look you're showing here. I'd rather see reflected greenery than a plain wall or fence, any day. To me, the idea sounds ridiculous. Not because of its impractical approach and uselessness, but threats it brings to wildlife and forests. I would put this on my screened-in porch. I love this decor idea!